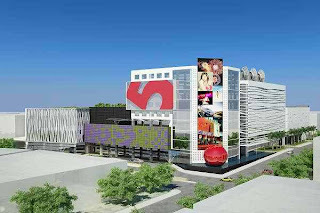 The TV5 Media Center is massive complex designed by top foreign and local architects . Phase 1 should be finished by late this year. By then our news team can already move to Mandaluyong from Novaliches (makesit easier to cover the news). 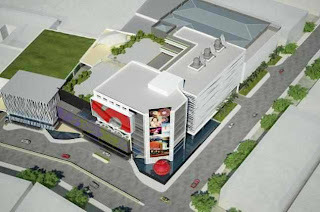 For phase 2 (2012), the Entertainment group will be able to move in as well. One of the Entertainment studios will be able to accommodate up to 1,200 people! The complex also will feature LED screens in its walls. 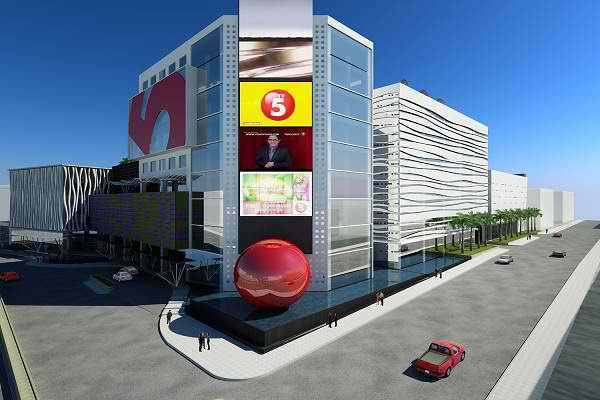 Soon to symbolize TV5’s remarkable growth is the iconic rise of the TV5 Studio Complex in Mandaluyong ’s booming Central Business District, an elevated location that naturally yields better and clearer broadcast signals. Housing a 9-storey corporate building and two 5-storey buildings for news and production, the TV5 Studio Complex features the leading edge digital video archiving system called Media Asset Management and other highly advanced broadcast systems that will propel the network to the forefront of broadcast technology. The event was attended by TV5 president Manny V. Pangilinan, Chief Executive Officer Rey Espinosa, External Vice President Roberto Barreiro, and other top executives and broadcast journalists of the network. TV5 President Manny V. Pangilinan (fourth from the left) leads the groundbreaking ceremony of its soon-to-rise facility in Mandaluyong City. “ We are very serious about the business,” said Pangilinan. The new building will attract those who are willing to fall in line for hours just to be able to get passes for their favorite shows. It will also cater commercial establishment that will invest in the area. The Media Center will have three entrances, first of which is the News Center lobby leading to the cathedral-like space of the newsroom and adjacent news studios. Second is through the grand lobby leading to the nine- storey corporate tower and production studio complex. The third is the audience entrance comfortably accommodating people who want to be part of the network ’s taped and live programs. Though it will be a tough years ahead of them, Pangilinan said they see all the potential of the channel. “It’s not that easy kasi unlike sa telecommunication business very competitive. Ang nature ng tv network, oras oras nag-iiba ang competition so you really have to keep the ball rolling. You need to have creative input, creative element to be able to succeed. But at the end of the day it ’s about the people who work with us,” noted Pangilinan. Mandaluyong City Mayor Benhur Abalos, who graced the groundbreaking activity, also thanked Pangilinan for building the state-of-the-art Media Center in his city. “TV5’s presence in Mandaluyong’s Central Business District is a great boost to our city ’s development as a global business hub. 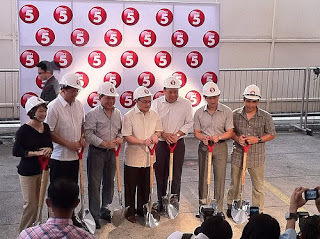 We look forward to the completion of the TV5 Media Center so we will finally have a major broadcast network in the heart of our city,” he said. THE Kapatid Network (TV5) unveiled its soon-to- rise Media Center in Mandaluyong City. The latest project had its groundbreaking activity Sunday morning in Reliance corner Sheridan Streets. It will also house one nine- storey corporate building, two eight-storey office spaces, television production and post-production areas, radio booth, underground garage, TV5’s Technical Operation Center, and a working roof deck. Though they are coming up with the latest Media Center plan, Pangilinan cleared that their Novaliches and Broadway studios will be retained. TV5 also operates and airs from various studios, namely, Skydome in SM North Edsa, Marajo Tower in Bonifacio Global City in Taguig and PLDT Locsin building in Makati City. The project will have a total floor area of 66,000 square meters and will feature corporate office, television production space, and cutting-edge broadcast facilities. More PHOTOS for TV 5 Network Television Project. Congrats and more improvements for this TV 5 Television Network.